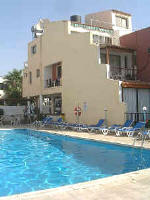 GENERAL DESCRIPTION: Situated in Kennedy avenue just off the Nissi Avenue in Ayia Napa. The apartment is in a residential block so is quiet. One twin bedroom, Entrance area is suitable for the 2 Z beds available. The Lounge area has a double sofa bed which slides open to give a 4ft 6inch bed There is also storage under the seat area. Basic cooking facilities which Include a two-ring hob, kettle, toaster and fridge. There is all the basic crockery you need,i.e plates, bowls, cutlery, glasses and saucepans. Communal Swimming pool. A/C in bedroom.Fans in other rooms. DISTANCES 5-7 mins to the Beach. 15 mins to The square. Included in the price - in the bedroom only.